Use diluted in small amounts topically for healing joint pain. Black pepper essential oil provides a pleasant warming effect on the joints while its analgesic compounds go to work reducing pain. Because it is so strong, it can be a bit harsh on sensitive skin, so be sure it is well diluted—no more than one or two drops per teaspoon of carrier oil. This highly effective natural analgesic oil works on most types of pain, including both rheumatoid arthritis and osteoarthritis, as well as gout—a type of arthritis of the big toe. Because it is extremely potent, use only one drop to one hundred drops, or about one teaspoon of carrier oil after first conducting a skin patch test. Avoid using if you have extremely sensitive skin. Ginger essential oil brings a soothing warmth when applied to arthritic joint, but it is also great for easing the muscular pain and stiffness of fibromyalgia. Use no two to three drops in a teaspoon of carrier oil and apply topically to affected joints. Both a pain reliever and nervous system relaxant, lavender is good for easing joint and muscle aches, as well as easing stiffness. 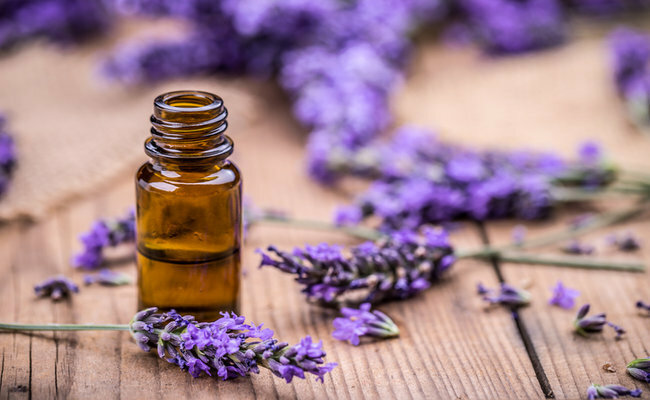 If pain is keeping you awake at night, lavender essential oil is also great for sleep, particularly if a drop or two of the essential oil is rubbed on the soles of the feet or palms of the hands before bed. While most essential oils need to be diluted, lavender can often be tolerated neat (undiluted) by most people. However, if you have extremely sensitive skin, dilute two drops of lavender in about 4 drops of a carrier oil like fractionated coconut or apricot kernel oil. Lemongrass oil is useful for toning the connective tissues and can be helpful when the tendons no longer hold the joints with precision. Dilute in few drops in a teaspoon of carrier oil. Marjoram oil can be used for easing muscle aches and stiffness along with helping to heal bruises and joint sprains. It is a good choice for topical use for those with fibromyalgia, which is a form of arthritis. It helps with pain but also alleviates muscle tightness. Avoid marjoram essential oil if you have epilepsy. Peppermint contains analgesic compounds that reduce pain and inflammation. Like lavender, it can usually be tolerated on the skin in its neat form (undiluted) to help reduce pain. A little goes a long way as this oil leaves an intense cooling sensation on the skin. Use one drop and massage into painful or inflamed joints. Wash hands immediately and avoid eye contact. After diluting the oil in carrier oil, always conduct a 48-hour patch test on a small inconspicuous part of your skin to determine whether you have any sensitivity to the essential oils. Dr. Michelle Schoffro Cook, PhD, DNM is the publisher of the free e-news World’s Healthiest News, president of PureFood BC, and an international best-selling and 20-time published book author whose works include: Arthritis-Proof Your Life: Secrets to Pain-Free Living Without Drugs.